Are you planning on purchasing Disney's Frozen? 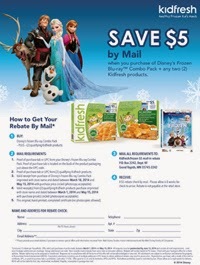 If you are (or already have) make sure you save your receipt, grab this rebate form from Kidfresh and purchase two qualifying Kidfresh meals to get $5 back in the mail. Find all the details here.